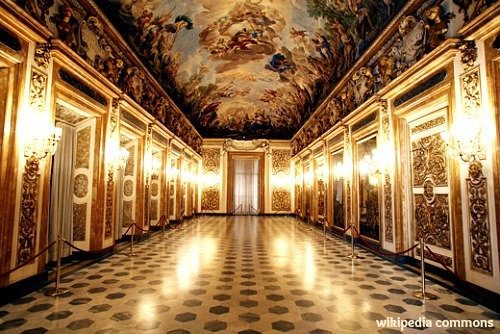 Palazzo Medici Riccardi (the Medici Palace) is the renaissance home where the powerful Medici family lived. The palace is most famous for its Cappella dei Magi, the family’s private chapel decorated with frescoes by Benozzo Gozzoli, an artistic gem admired the world over. Although the building has undergone changes over the centuries, the parts of this majestic residence that have remained intact are quite worth visiting. 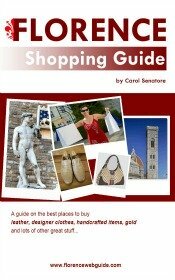 Another impelling reason to go the the palace is simply to be in a place associated with many significant events and a large part of Florence history, especially in the 1400 and 1500’s. 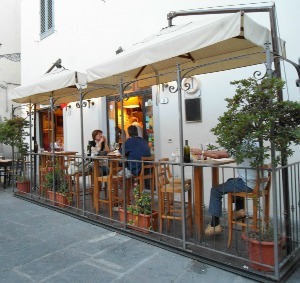 Read all about this Firenze landmark and find out ticket info and opening hours below. Cosimo de Medici (called the ‘Elder’), the first member of the family to wield power in Florence, had the palace built in about 1445. 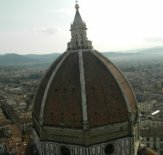 Originally Cosimo had Filippo Brunelleschi (the master architect, designer of the cupola) draw up a design for the building. But Cosimo, although extraordinarily wealthy, was a modest man and he found Brunelleschi’s vision too grandiose. The Elder then opted for a simpler design by Michelozzo. 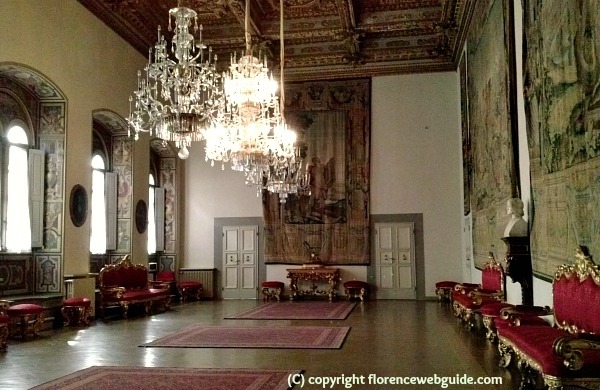 The family occupied the palace for generations until - in the 17th century - the Medici's had become Dukes and moved on to live first in Palazzo Vecchio then in Pitti Palace. In 1659 the family sold the home to the marquis Gabbriello Riccardi, one of the administrators at the Grand Ducal Court of the Medici. 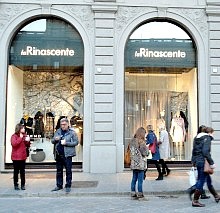 Under the Riccardi the building underwent many changes with the interior taking on the Baroque style popular in the 1600's. This palace was the main home of Lorenzo the Magnificent (1449-1492), Cosimo the Elder's grandson and the unmistakable Lord of Florence. This was where, in 1478, the Pazzi conspirators came to pick up Lorenzo and his brother Giuliano to accompany them to the nearby Duomo for mass with the intention of assassinating both (they only succeded in killing Giuliano during the service). This is where, in 1489, a 14 year old Michelangelo came to live as a teenage artist under the sponsorship of Lorenzo de Medici who actively sought to cultivate the development of young talent. This is where, in 1494 when the Medici were temporarily banished from the city, the citizens came to loot the building, taking away many of the renaissance masterpieces. 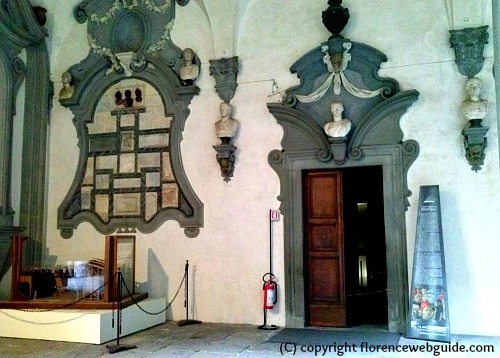 This is the home where Lorenzo's sons Giovanni and Giuliano return to from exile in 1512, to eventually rule Florence again - soon after Giovanni became Pope Leo X, the first Medici pope. This palace was where Catherine the Medici - future queen of France - lived as a little girl in the early 1500's. 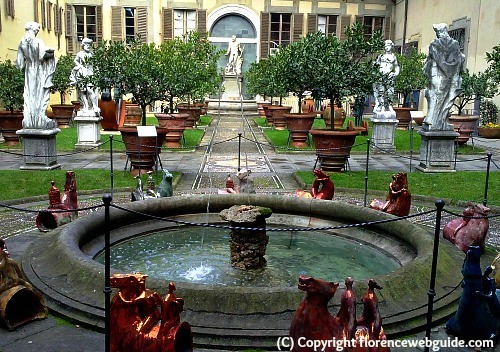 The courtyard of the palace was where Donatello’s famous sculpture 'Judith' as well as his masterpiece, the bronze David, originally stood (both commissioned by the Medici). And more recently, in 1938, here is where a dinner between heads of state, Benito Mussolini and Adolf Hitler, was held in the Gallery room of the palace. 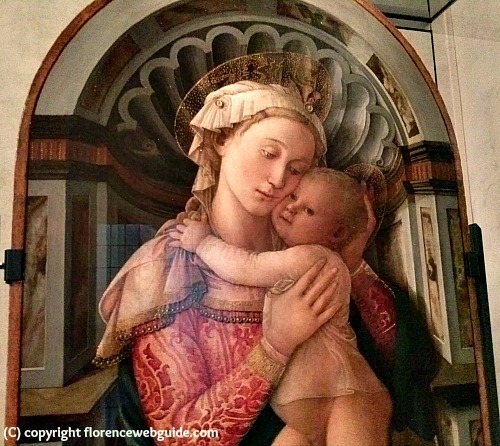 In 1459 the Medici commissioned Benozzo Gozzoli to paint the family’s private chapel. These frescoes are the highlight of the Palazzo Medici Riccardi that visitors flock to see. The very small, quaint and charming chapel has remained quite intact from Renaissance times and still contains all of its original furnishings. 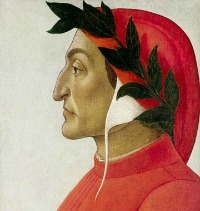 Gozzoli was a pupil of Fra Angelico's (see San Marco) whose influence can be seen in spite of Gozzoli's much more vibrant use of color and fantasticated landscapes. The apparent subject of the painting is the 'Procession of the Magi', the three wise men on a journey to Bethlehem to see the newborn Christ child. In 1438 Cosimo financed a meeting called the Council of Florence in which the Eastern and Western factions of the church tried to resolve their differences. For this occasion the city became host to multi-national dignitaries and high-ranking authority figures from exotic eastern locations. 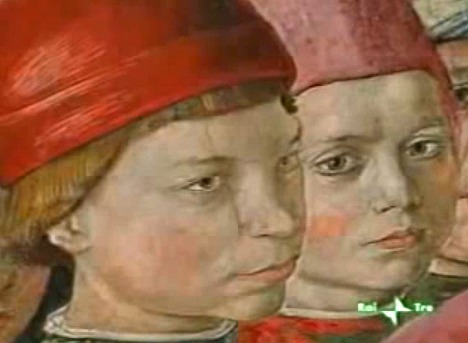 Gozzoli's fresco, with its clear Byzantine images, is meant to recall the highly prestigious episode and the part the Medici's played in it. The painting is also full of portraits of significant figures, including Medici family members. There are representations of John Palaiologus, Emperor of the East, and Pope Eugenius IV, but also of Cosimo the Elder, Lorenzo the Magnificent and his brother Giuliano and their father Piero de Medici and others. Some of these portraits are idealized representations of the Medici while others are actual likenesses. 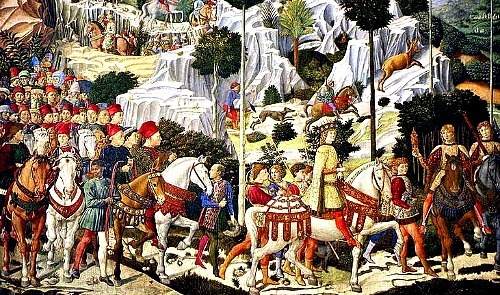 Below see an idealized version of Lorenzo the Magnificent represented as a young king on horseback. In both instances however, the purpose is the glorification of the family for posterity. The colors are marvelously bright (the painting was restored in 1992) and the details of the sumptuous attire the subjects wear are highly meticulous. Even the adornment of the regal horses carrying the dignitaries reeks of opulence, illustrating the stature of these visitors to Florence and the longevity of the impression that this event made on the citizens of the city, Gozzoli first of all. 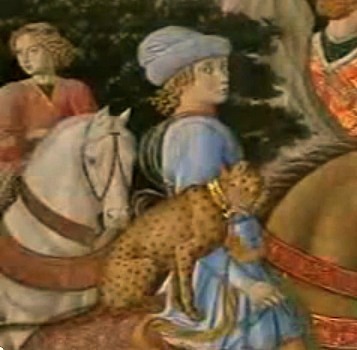 Below see Giuliano de Medici, also an idealized likeness, with a Cheetah, animal typical of Asia and seen in Florence when brought by the Byzantine representatives. Below is a true to life representation of Lorenzo (left) and Giuliano. At the time of the painting these images represented the boys' real age, about 10. 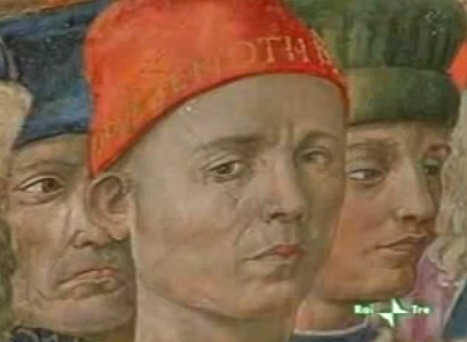 The artist slipped his own self-portrait into the fresco (below). 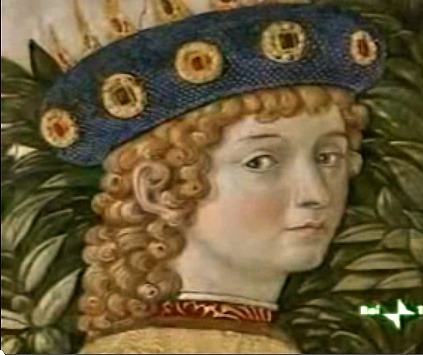 Not only is this the face of Benozzo Gozzoli but his name is also written on the cap to dispel any doubts! 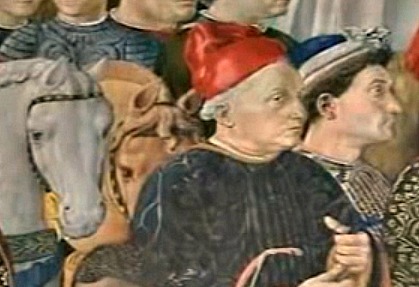 Although no longer living at the time of the painting, Cosimo the Elder was included in the crowd (below in red cap). Gozzoli's mural is not the only painting in the chapel however. Above the altar in the Chapel of the Magi is a replica of Filippo Lippi's reknown work, 'the Adoration of the Christ Child' (the original is in Berlin). 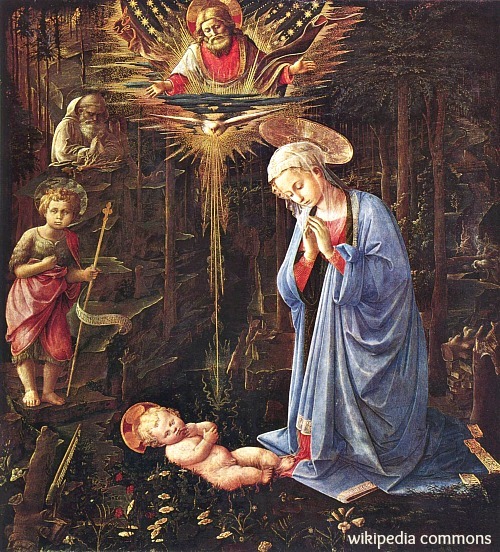 Lippi's painting was the first work of art to adorn the chapel. The scene of mother and child alone in the dark forboding woods, with only a few angels in background for company, is a highly unusual and original interpretation of a common biblical image. If you would like to watch a fascinating documentary about the dramatic life of this unique work of art, see Private Life of a Masterpiece. 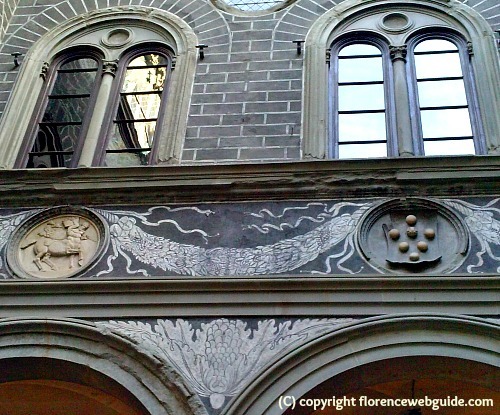 Another part of the Palazzo Medici Riccardi to have remained intact from the 1400's is Michelozzo's courtyard. This area, with its Corinthian columns and vaulted ceilings, was the fulcrum of the building around which all other activity was organized during Medici times. Looking through the main entrance to the palace, the courtyard allows you to see from the entrance door through to the back garden, giving a sense of openness and welcome. 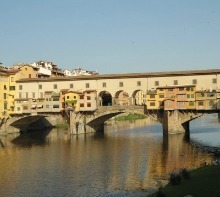 This is where Cosimo met with the citizens of Florence to discuss affairs, where the family's large banquets were held, and where shows, weddings and celebrations were organized. Along the walls you can see a large collection of antique pieces, made up of busts, heads, reliefs, urns and Roman sarcophagi which once belonged to the Riccardi's. 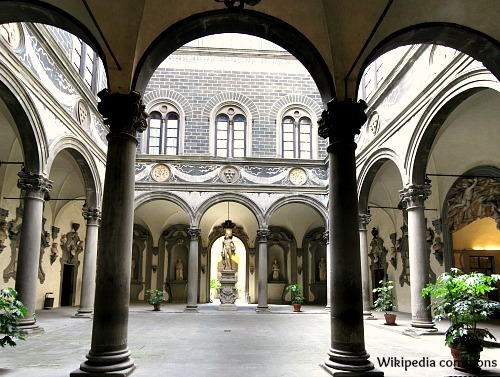 Placed here in the 17th century, these additions to Palazzo Medici Riccardi enriched the courtyard in a way the Medici - who revered all Greek and Roman antiquity - would have approved of. Above the arches is a long freize with medallions of Medici coat-of-arms and reliefs of mythological figures. This sculpture of Orpheus by Baccio Bandinelli was commissioned by Giovanni de Medici - the future Pope Leo X - and dates back to about 1515. 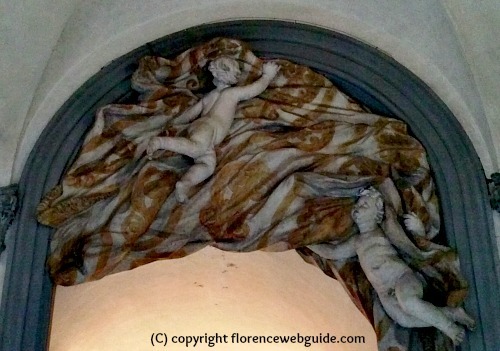 See below this lovely image of cherubs, called putti, who are holding up the drapery. This arch leads onto a hall lined with circular terracotta portraits of illustrious Florentines (circa 1718). It is widely believed that this door just off the courtyard leads to what was once Lorenzo the Magnificent’s bedroom chamber. The room today holds a multi-media display of what the room would have looked like when Lorenzo lived there. Based on inventory taken in 1492, the year of the Maginificent's premature death, the chamber was home to great works of Renaissance art that are shown in the display. Below is the lemon garden full of citrus trees. The marble museum is located at the back. 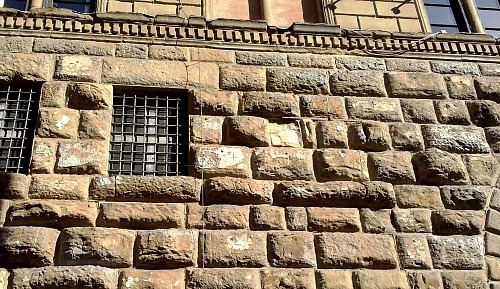 The Medici Palace has a typical rusticated exterior common to Renaissance buildings. The 'rustication' effect is meant to be both imposing yet elegant. 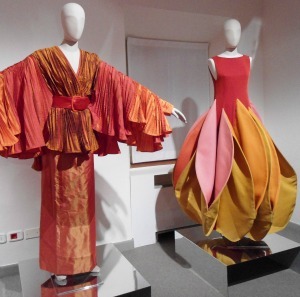 'Imposing' to show the importance of the family, 'elegant' to remain consistent to Renaissance sensibilities of beauty. On the lower level, there is a heavy, rough look with coarse stones sticking out. The windows have bars to keep people out in the event of insurrection. As the building rises, the second level is smoother, bricks (really stucco work) are smaller, and the building takes on a lighter look. 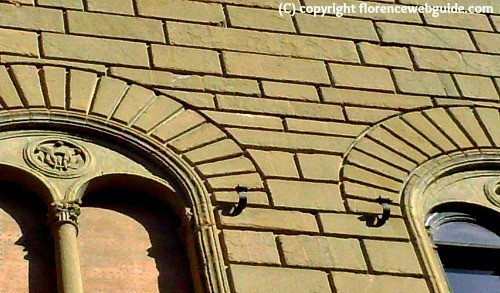 Notice the windows with a ‘triumphal arch’ shape, another characteristic common in Renaissance architecture inspired by Roman military arches so widespread in antiquity. The top level of the building has a delicate refined facade, providing a light finish to the exterior. 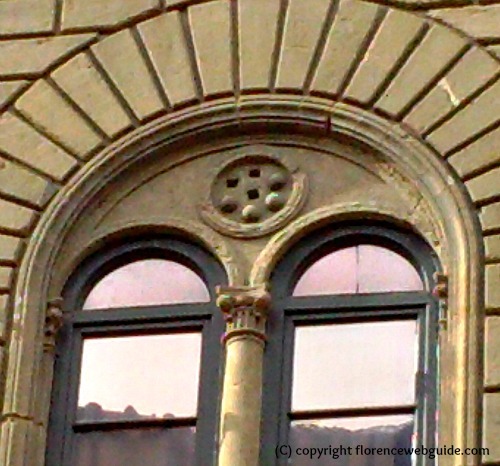 This rustication effect - from rough and rocky to smooth and delicate - can be seen often in Florence with Palazzo Medici Riccardi having been one of the first palaces to use this style. 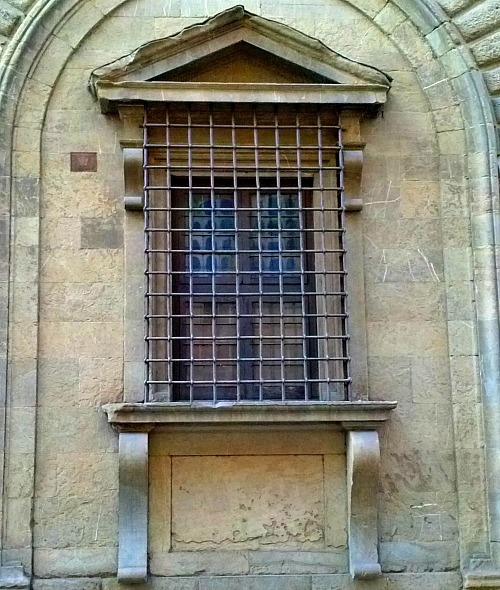 The picture below shows what is called a 'kneeling window' ('finestra inginocchiata'). The original loggia of the 1400's had more open arches to access the ground floor which were eventually closed off through the use of this technique. This architectural novelty was designed by Michelangelo in 1517 as a way to close off the arch in an aesthetically pleasing manner. The name comes from the long 'legs' below the window sill that seem to have knees jutting out. 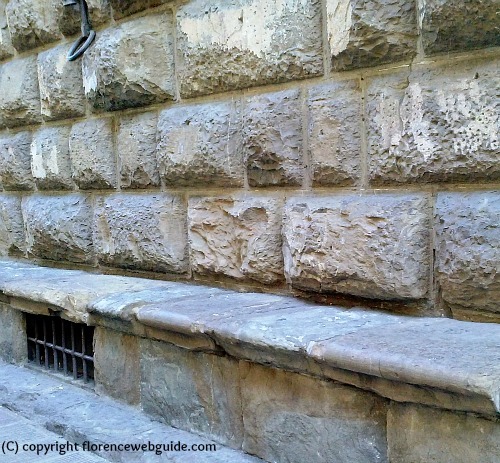 Below ia a picture of the stone bench incorporated into the exterior of the building, a place for people to sit while waiting for their turn to go in a speak with Cosimo. 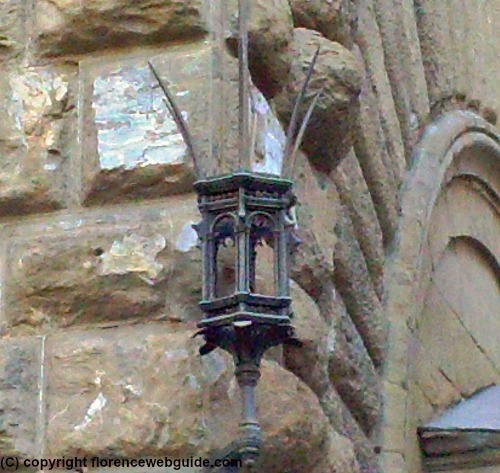 This lovely corner lantern in cast iron was commissioned by Lorenzo the Magnificent. 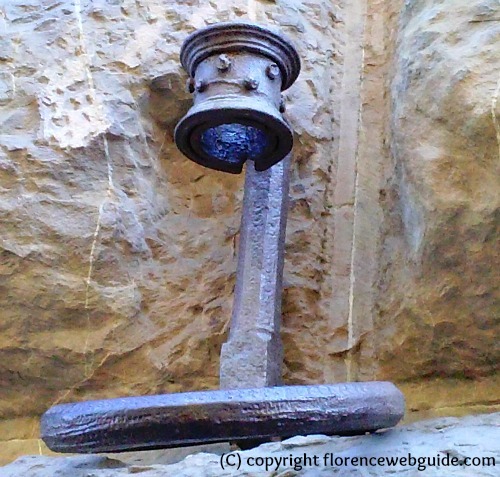 The exterior of Palazzo Medici Riccardi is adorned with iron rests used to hold torches and decorations. Torches illuminated the building at night and ornaments used to be put up to embellish the palace during city feasts and festivals. 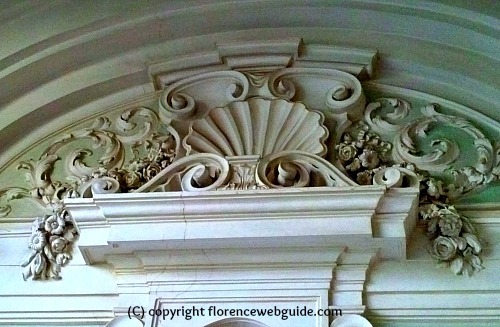 When the Riccardi's bought the palace in the 17th century a more Baroque style was given to the interior such as this 'busy' stucco work. 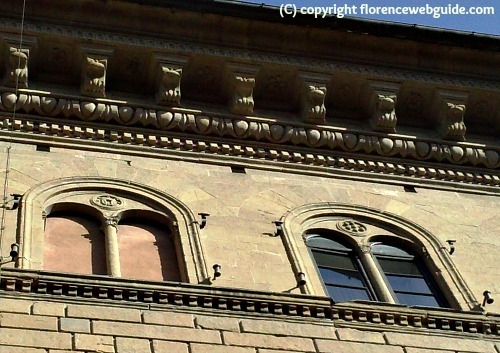 Palazzo Medici Riccardi originally was a cube shape, with 10 windows across. Today we see it as a rectangular, with 17 windows. 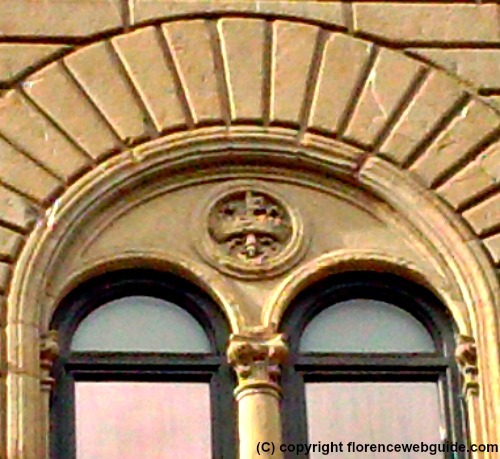 The cut off point can be easily seen by the fact that the family crest changes: the original windows have the Medici balls, the annexed part constructed by the Riccardi's, the family key crest. 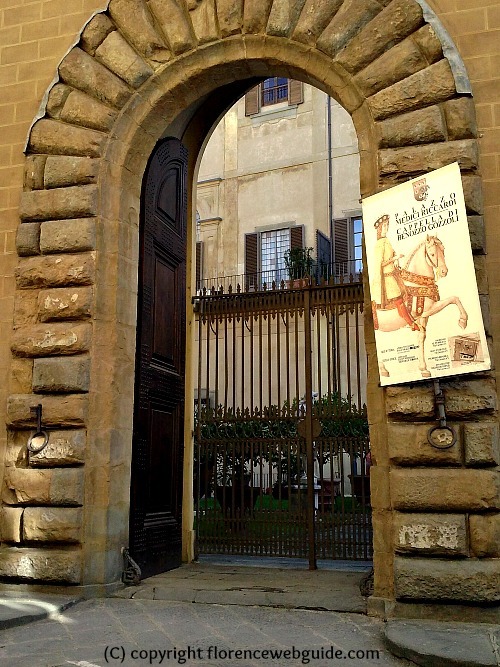 The doorways at Palazzo Medici Riccardi are tall to allow horses and carriages through. 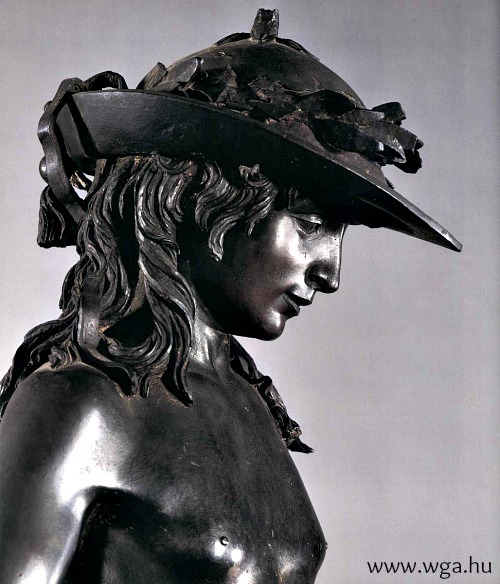 The former Medici residence is also home to some noteworthy pieces of art. These include a Lippi original, the Madonna with Child (below) dating to the later years of the artist's life (circa 1465). Interestingly, the back panel of this painting has some sketches drawn also by Filippo Lippi that can still be seen, possibly rough drafts done by the artist for a future work. 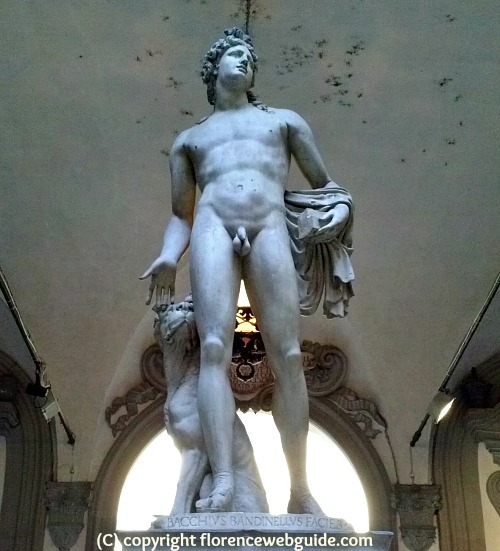 Palazzo Medici Riccardi is also home to the Museum of Ancient Marbles. 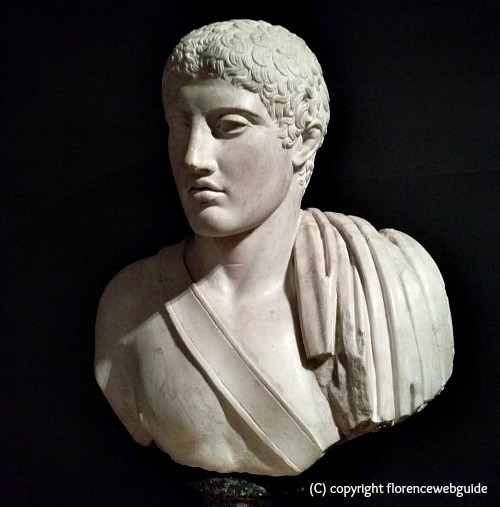 Going down a flight of stairs at the back of the Lemon Garden takes you to a three room display of marble busts from Greek and Roman antiquity, some stemming from the 1st century. Among these marbles is the highly admired 'Riccardi Athlete' (below), donated by Rccardo Riccardi. 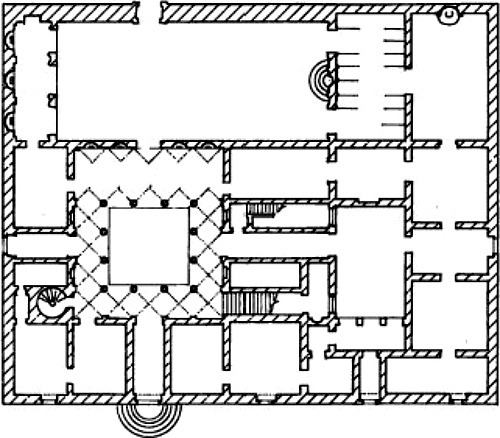 Below is a plan of the building as it is nowadays. 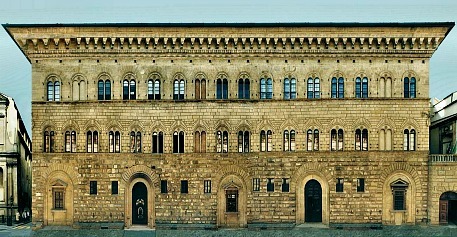 The right side - added after the Medici had sold the palace - is used today as offices for the Province of Florence.